In 2010, we became the exclusive master distributor and representative for Hyundai Heavy Industries’ electric motors for North America. We pride ourselves on our leading edge technology, incomparable customer service, and product availability. When you contact us, you will always speak with a live person who can answer your questions and fulfill the specific needs of your order. We even provide 24/7 service for any emergency and have five warehouses with $25 million worth of readily available inventory that can be shipped to meet your needs. Our low voltage product line includes both single phase (⅓-10 HP) & three phase (⅓-600 HP) motors from 1/3 horsepower through 600 horsepower. Our medium voltage product line includes motors up to 20,000 horsepower. Worldwide Electric also manufactures a line of shaft mount reducers and right angle worm gear reducers, a complete line of motor controls, soft starts, variable frequency drives, and enclosed drives. 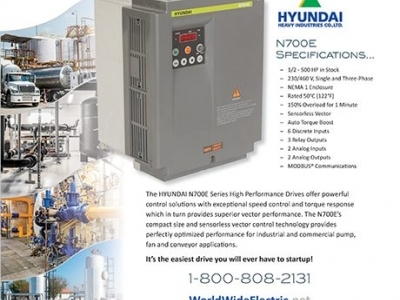 Through Hyundai, we offer general purpose TEFC, IEEE-841, UL explosion proof, Marine Duty, ABS Type Approval (so motors can be selected by ship designers, builders, owners to be placed aboard an ABS-classed vessel), and medium voltage motors. All of our motors are specifically designed to meet the requirements to domestic and international standards for use in chemical, mining, power generation, steel plants, municipal water, and oil and gas applications.